Kids can help to prepare this after school snack! Line a sheet pan with wax or parchment paper. Place all fruit in a single layer. Place sheet pan in the freezer for 2-4 hours. Microwave chocolate and peanut butter for 1 minute and 30 seconds. Stir; continue microwaving in 30 second intervals, stirring in between until fully melted and smooth. 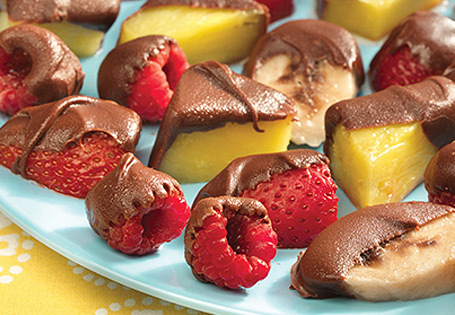 Using your hands or a toothpick, dip the fruit halfway into the chocolate mixture and place on a wax paper-lined baking sheet. Place into freezer for 10 minutes or until ready to serve. TIP: Kids can help make the dip by combining the chocolate and peanut butter and pushing the microwave buttons!